The mobile platform is the face of business in recent times. Mobile Applications are a significant part of the active lifestyle of the global population. People across all geographies are currently performing various tasks through apps, be it entertainment, online shopping, information, search and browse, bill payments and much more. Hence, it is essential for businesses to enhance customer experience over mobile for better branding and revenue generation. Progressive Web Apps (PWAs) are a significant step towards this innovation. Put in simple words, progressive web apps are websites with the look and feel of a mobile app. The primary focus elements for every business are the retention of existing customer base and reaching out to the potential customers. Higher conversion rates ensure that the revenue generation stream remains stable in the future. However, as per published sources, it has been observed that a website loses 7% of its conversion rate with the 100-millisecond delay in loading. The higher wait time has a negative impression on customer attention. It is a major setback towards brand recognition that significantly impacts business growth. Progressive Web Apps are a constructive approach to reducing this downbeat impact. PWA apps are faster to load that aid in capturing customer attention in the right essence. There is no download or installation required for PWAs. Hence, it contributes positively to boosting conversion rates. Apart from this, among other recent developments, Google recently announced that page speed will be considered as a search ranking parameter. With this progress, it can be expected that the inclination towards the adoption of PWAs will rise at a steady pace. The global corporate arena has been positive responsive towards PWA adoption at a significant scale. There are quite a few international brands that have launched their very own PWA. Uber PWA was launched with an aim to load faster in 2G networks. The Uber PWA has a load time of fewer than 3 seconds in 2G and is 50K in size. The entertainment platform BookMyShow has also joined this PWA bandwagon in recent times. The BookMyShow PWA has a load time of fewer than 3 seconds. Moreover, the brand has confirmed an increased conversion rate of 80%. The PWA is more than 50 times smaller than the Android app and close to 200 times smaller than the iOS application. This results in quicker load time. Tinder is a popular name in the online dating segment. In fact, it is currently the most preferred dating platform. It has launched its new PWA which has reduced the load from a massive of 11.91 seconds to just 4.69 seconds. The new PWA of Twitter is 90% smaller than the native Android app of the brand. Twitter has confirmed that this has increased user engagement to a noteworthy level. Another success story to the list is Trivago. The travel and tourism planner brand has witnessed an increase of 150% in case of users who have added the PWA to their home screen. This has paved the path for increased engagement. There has been a noteworthy increase in hotel offer click outs amounting to 97%. The PWA has facilitated the users to browse the website in the offline mode. Moreover, it has been observed that close to 70% of the users continue to search and browse when they are back online. Progressive Web Apps are new age web applications which are characterized by regular loadings like that of any website or web page but with certain additional functionalities. They can work offline and push notifications along with device hardware access. The last one is primarily available only to native applications. Hence, progressive web apps are a combination of the best of both platforms. It offers the flexibility of a web with an enhanced experience of native applications. As a result, it is the advanced mechanism of customer experience. The users get a mobile app like feel through the browsers. After an insight into what is a progressive web app, it is essential to understand the utility of the same. Progressive web app benefits are both technical and business-centric in nature. • PWA apps are both smaller in size which makes them quicker to load. In addition to that, there is no requirement for installation also. This helps in freeing up the phone memory. • Another eye-catching feature of PWA apps is offline functionality. Therefore, these can be used without an internet connection and does not eat up on the data. This significantly contributes to the customer experience. • Push Notifications have proven to be one of the effective tools for generating interests among users. Until now, this feature was restricted to native apps only. PWA apps provide this feature as well. • In the case of native apps, there is a constant requirement for updating. Manual updates are tedious and updates through mobile data result in a high level of data consumption. PWA apps are free from such hassles. • These applications are instrumental in increasing SEO quotient and accessibility. Since PWA apps load faster, they get a searching ranking booster. • Lastly, they can be very useful towards extensive market outreach, thus benefiting the brand recognition factor. While there are many remarkable benefits, on the other hand, there are certain progressive web app limitations also. • As it is new technology innovation, progressive web feature addition to the web apps requires an additional time frame. There is a lack of standardization as well in this case. • There is no complete access to the device hardware in case of PWA apps. Unlike native apps, full access is still not in place. • In the case of recent web browsers, the support is commendable. But in the case of legacy browsers, it can be a bit difficult. Google has been one of the early birds in case of progressive web apps. This fact was clear with the launch of Chrome 70. There are many new features in the newest version of the Google web browser. One of the primary elements of the feature lot is that the PWAs work with desktop Windows. In this case, the recent developments suggest that two of the technology giants Microsoft and Google have collaborated on this front in recent times. Due to Chrome 70, PWAs can function as regular apps in Windows 10. This ensures support in terms of notifications, Live Tiles, and Cortana. All these are accessible from the Chrome menu and the Start Menu. They can also be used as pinned apps on the taskbar. Subsequently, they are also available in the Microsoft Store. PWA apps are receiving a lot of attention in recent times. Hence it has become essential for the different platforms to incorporate PWA functionalities. iOS is no different. With the launch of iOS 11.3, the support for PWA is already visible. Therefore, now the users can install applications without the approval from the iOS App Store. There are certain features related to this development. The users have access to certain functionalities with the web platform on iOS. These include geolocation, sensors, camera, audio output, and Apple Pay to name a few. However, users will not be prompted or there will be no invitation for the PWA apps. The users need to visit a specific PWA URL in Safari and press the share icon followed by the “Add to Home Screen” option. Hence there is no specific indication that the visiting website is a PWA. This is one of the setbacks currently for progressive web apps on iOS. With the increasing popularity of progressive web apps, it is essential to understand the building blocks of the same. It is important to choose the appropriate progressive web app framework in order to optimize performance and business benefits. Below are some of the popular choices of frameworks for PWA. Angular is one of the most preferred choices for front-end web app development. Presently, it is also capable of creating progressive web apps that are dependable and responsive in nature. The newer versions namely, Version 5 and 6 of Angular are capable of PWA development. There is a new version of Angular Service Worker present in Version 5 that enables in-built PWA support. Angular 6 includes new CLI commands. Therefore, these developments have made Angular PWA more compact and comprehensive. The download and installation are convenient due to such updates. Angular is one of the most trusted web development frameworks in recent times. It’s two-way data binding feature is helpful towards the reduction of development time. Furthermore, it has a Model View Controller (MVC) architecture. There is perfect synchronization between the data change in Model which alter the View accordingly. In addition to that, now it has Service Workers that are supportive of PWA apps creation. Hence, Angular PWA is ideal for development. This supports better inspection of changes in the application. It also captures various states of the same. The virtual Dom feature enhances the efficiency of the UI. With such benefits, React can be used for PWA apps creation also. Currently, a combination of React.js and Create React App (CRA) can create progressive web apps by default. The CRA has the necessary elements required for building React PWA. Thus it is an efficient and comprehensive framework for PWA apps. Vue framework is one such platform that combines the elements of both Angular and reacts platforms. It is based on JacaScript. The template style of this framework is similar to that of Angular. Meanwhile, it has component based props which are similar to that of React. Thus it has become a preferred choice for building PWA apps. There is some additional functionality which aid in building Vue PWA apps. The developers can get the necessary elements for Vue PWA to build up from the CLI. It acts as an initiation tool for building a PWA. The installation of Vue CLI can be done using a single command. Vue has simplistic architecture. Therefore, it is easy to understand and integrate. It also includes automated tracking of components dependencies. All these features make Vue an important framework for PWA development. 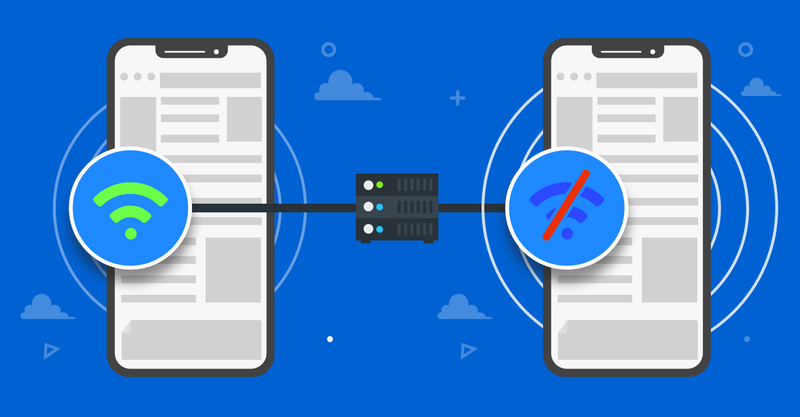 Ionic is an open source framework that is perfect for PWA development. The code structure is manageable. Therefore, it is time and cost efficient with reduced efforts at the developer end. It is a cross-platform application development framework. Hence, it uses one codebase. The resulting applications adapt to the different platforms accordingly. This framework has Angular support. Ionic includes Cordova Plugins and robust CLI for cross-platform application development. Additionally, there are rich UI elements that are advantageous for Ionic PWA development. Progressive web apps are a significant step forward into application development segment. Mobile application and websites both contribute significantly towards enhancing customer experience. PWA apps are a stride ahead in this approach. They combine the best of both the mobile application and website features. It is important to understand that every business has its very own app. However, downloading and installing apps for every product, service or platform is not a feasible solution. PWAs are a fresh outlook to the scenario. Without installation, progressive web apps provide the benefits of website browsing through the look and feel of the application. Thus, it can be predicted that they are the future in the app development sector. Originally published at Unified Infotech Blog.